Thanks to its recent revamp, the Impala is again a standout in the waning full-size sedan segment that includes the Dodge Charger, Ford Taurus, Chrysler 300 and Toyota Avalon. For 2015, the Chevy Impala continues to redefine the segment with new technology and the availability of a bi-fuel model that can run on gasoline or compressed natural gas (CNG). Roomy car great for young families. The car has traction control that is automatically on every time we start the car, so we have to turn it off. It also randomly turns back on without us pushing the button. This happens most often when the weather is cold. It has a remote start feature, which I love. It is nice to get the car melting without having to leave the house. The car is roomy, so I can comfortably fit two car seats in the back without having to have the front seats uncomfortably far forward in order to allow the rear facing one to move freely. We recently hit a cow in the car, and it was well built enough that it took the impact well. The only damage was cosmetic, and the airbags didn't need to deploy, which was nice. I suspect this was in part because the car was built well, so it could take the hit without carrying the damage or impact further onto the car. The trunk is huge, which was a big factor in us purchasing the car. It is easy to fit bags, portable cribs, and various other necessities for travel into the trunk, so that there does not need to be anything in the main car area. Makes for a great family car and has the get up and go that everyone looks for. This is actually the first Impala that I have ever owned and I must say that I love it! I get really great gas mileage. . . About 32 miles per gallon. All of the features my car offers couldn't be any better and my favorite would have to be the remote start, great for those chilly mornings. 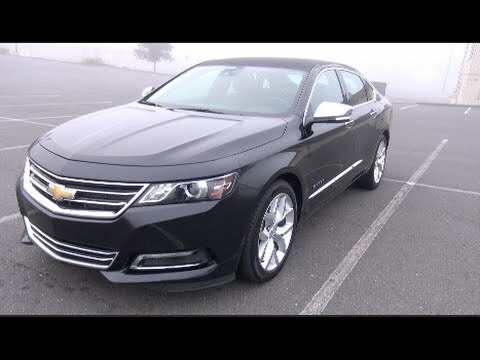 This Impala makes a great traveling car because there is plenty of room for the passengers but it has amazing trunk space and has plenty of room for everyone's luggage and all of the goodies we find along the way. The only downfall I do not care for though is that my tire gauge sensor is always going off and I am always having to add or let air out of the tires. Other than that I couldn't be any happier with my purchase! I love the way the cars back seats fold down to be able to put all of my groceries in the back. I especially love it around Christmas time for the presents we buy. We can fit a lot of items in the back. My car is very comfortable. I get great mileage. Our car has gone back and forth to n.c several times and we never had a problem with our vehicle. The color of our car is white. The interior is grey. The driver seat is comfortable. It has a lumbar installed and you can adjust it to your liking. Considering my husband and I both drive this it's wonderful to adjust this to each individual. I love the way the back seats fold down. When we buy large items we are able to fit different items in our car. Large items like wood or tv and other large items. I can fit allot of my groceries in the back end. When we travel, there is alot of room for everything we need to bring. I love my car.